snowdeal.org > ex machina: the eric update - day 225: odin's epicurean adventures! the incredible, edible egg. the eric update - day 225: odin's epicurean adventures! the incredible, edible egg. that's right, it's time for another epicurean adventure! and unlike previous adventures, little odin actually gets to enjoy the taste of final product instead of simply smelling the smells, which means if we don't count the rice and barley that we added to his milk to help control his reflux while in the nicu that this - the humble egg - will be his first experience with "real" food. yes, you read that right. we're feeding him a smidge of egg yolk. why are we feeding him egg yolk? i'll admit that it seemed a little strange to me, but the yolk is packed with iron and dha (docosahexalnoic acid). 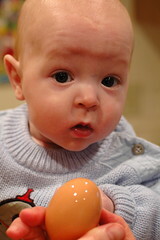 and eggs are a relatively common "weaning" food given anytime after an infant is six months old. while breast milk doesn't contain much iron, iron deficencies are rarely seen in breast fed babies before 6 months because infants are so good at absorbing the small amounts it does contain. but after 6 months the iron stores can begin to diminish, so it's often recommended to find a supplement. the quick witted in the crowd will notice that we're playing a the Age Adjustment Game. are we starting to think about supplements a little early because odin is 4 months of age in adgusted terms? or are we starting right on time since he's 7 months actual? we decided to err on the side of caution, since it's relatively well established that eggs can do some good without doing harm. of course, we consulted with our pediatrician to see if he thought we were being goofy and he thought it was a perfectly reasonable thing to do. it's important to note that we're only feeding him the yolk and not the "whites" since it's not unknown for infants to have allergic reactions to egg whites and egg whites can actually hinder iron absorbtion, which would defeat the whole purpose of this epicurean adventure. we boiled the egg produced by a local, organic, range fed hen for 3 or 4 minutes in the hopes of getting a yolk that wasn't hardboiled but not overly runny. it was a little runnier than i'd hoped, so hopefully we didn't give him a case of salmonella. i had a hard time remembering that he's never had the experience of operating a spoon, because he's obviously been taking notes at the dinner table! i thought it'd take him a while to get the gist of "food" and how that related to the tool known as a spoon, but once again he proved me wrong. after he got the first taste of the egg, with admirable acuity, he grapped the spoon and started shoving it in the general direction of his mouth. Another great first food is avocado. High in folate and potassium, and rich in lots of other vitamins too. Sweet Potato is also one that babies love, and it's really fun to make homemade and freeze in little cubes :) I would highly recommend the "Super Baby Food" book - but make sure you get a new edition, because obviously, recommendations change. 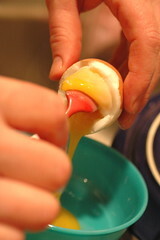 Egg yolks used to be recommended for 9 or 10 months old not as a starter food. That pendulum sways every few years I suppose. Have fun with your little muncher!